So, it’s summer and time for vacations. The question is where do you go with the wife and kids? There are so many travel vacation spots and locations all over the world. The problem is finding one that works for both the parents and the children. We’re talking about a place with loads of fun for all parties, but these are often difficult to come by. In fact, most family vacation spots either tend to satisfy the kids while boring the adults to death or vice versa. However, the few that are able to satisfy both kids and parents are usually a lot of fun for both parties. If this is what you’re looking for, the following vacation destinations are a must-visit this summer. If you don’t mind traveling outside the country to the Bahamas, the Atlantis Resort is an awesome summer holiday destination for both parents and kids. The Atlantis Resort is simply stunning in its sheer variety and offers an almost unlimited array of exciting and adventurous activities. No wonder it is often called the “Mecca of Family Vacation”. Popular attractions at the resort include the Current, Aquaventure, Mayan Temple Slides, the Dig, Coral Tanks, Underwater Walkways, Mandara Spa, Kids’ Pool, Fast Rapids, and Exhibit Lagoons featuring tons of aquatic animals. This spectacular park is an excellent vacation spot for the outdoorsy types. With outstanding features such as the multiple peaks, pristine lakes, virgin forests, multicolored pools, hot springs, waterfalls and awe-inspiring geysers, there’s more than enough to see and explore. Parents would do well to bring their kids so that they can witness what true, unblemished, natural beauty looks like. 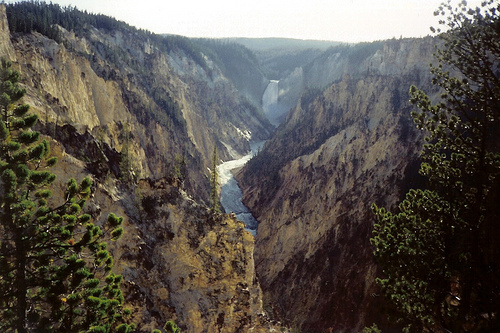 The park is home to various species such as buffalo, grizzly bears and an abundance of elk. The top attractions you need to visit include the Old Faithful – one of the world’s most popular geysers – which erupts every 90 minutes or so, the Grand Canyon of the Yellowstone Park (ideal for hikers and those who like long treks), the Yellowstone Lake, which is a truly breathtaking natural wonder and excellent for families who just want to take in the beauty and enjoy the serenity, the multicolored or rainbow-colored Grand Prismatic Spring is bound to take your breath away, and the Hayden Valley among others. Sure this is no Anaheim, but it is quite a sight to behold. Perfect for kids, it is often said that this vacation destination is one of Walt Disney’s best gifts to children. Top attractions here include the Epcot Center Spaceship, Shamu’s Flips, the dazzling Mickey House, the Seaworld Adventure Park, the Discovery Cove, the dizzying Wizarding World of Harry Potter, and the Walt Disney World. That is a grand total of 4 theme parks and 2 water parks. Honestly, this is the perfect definition of massive fun for both parents and their kids. Just plan for 2-3 days as it might be a lot to cover the entire Disney World in One Day. For those who absolutely love snow and skiing, there are places where you can ski to your heart’s content all year round. The Snowbird Ski resort located in Snowbird, Utah is one such place. Little wonder it is popular among all levels of skiers – beginner, intermediate, advanced and pro – who like to come here during the summer break to have some fun. So, get your skiing gear, take the kids, and go enjoy the slopes and lifts. For those who don’t like skiing outside, there are ice skating, luge sleds, snowshoe tours and snow tubing facilities available. When you’re done, send the kids to their rooms while you go get a stone massage at the Cliff Spa on the ground. Oscar King works as a travel agent, helping people to get the best deals on fantastic vacations. He tends to get a lot of people looking for cheap bulk vacation plans to use as sales incentives, and usually refers such individuals to Get Up and Go! for assistance. You can find more of Oscar’s work on Google+.